Before I get to the point, I’d like to give a big hearty thanks to Nitesh for the nomination. Quill is barely a month old, and I never imagined my blog would cross anyone’s mind. And that’s what makes me feel happy beyond words. That I could bring a smile on your face through something that I wrote, which was the very reason for starting a blog in the first place. This award (and many more interesting ones) is a courtesy of these wonderful people. I think it’s great that they came up with such a platform to encourage fellow bloggers. Don’t forget to pay a visit now, I guarantee they make a fine first impression. What made you want to start your blog? In other words, why do you write? From when I was a child, I found that I could communicate better through stories and drawings. As I grew older, it became a medium of expression until it became an integral part of who I am as a person. I write because that’s how I connect with people whom I probably won’t ever meet in person. Because it helps me experience the magic of words. 2. How do you describe yourself when ask who are you? I’m indescribable. I’ve lived with myself for 20 years now, and I still am not sure which words in the English dictionary will give you an idea of who I am. 3.What are your top 5 bloggers and why? 4. What type of posts do you like to read? I don’t have any particulars in that area. Blog posts are so much more about the people who wrote them than the actual words they’ve put into it. Anyone who recreates the magic that they are, through their words, earns my immediate attention. 5. Do you plan to change any styles regarding your blog? Blogging is perhaps the only thing I do that is unplanned. I honestly don’t know, but I think I’ll lean towards a yes. We evolve so much over the years that it is only fair to expect our blogs to do the same, right? 6. If you could host a challenge on your blog, what kind would it be? To do something that is completely different from everything you’ve ever done before. And then post a detailed piece on it so that I can read and get high on that exhilarating feeling. Selfish, I know, but I can’t help it! 7. What have you wanted to do on your blog but haven’t yet? Why not? There’s something I love as much as I love to write, which is to travel. I’m endlessly curious about the different places and their people. I’d love to write a post (a book, even) detailing the ways of some close-knit tribe in some remote land that no one has ever heard of. I haven’t done it yet because, well, I haven’t found them yet! 8. What is your best moment in life? The moment I was born as the daughter of my wonderful parents. For a long time I was unaware of just how much happiness I had in my life, all thanks to them. Once I stopped being blind, I could see so clearly – that was, and always will be, the most beautiful moment of this life. 9. Describe your taste in music. My best friend is a musician, and a great one at that. He’s the reason music is so close to my heart. Trying to describe music through words, in my opinion, might be a little unfair. Music is a different language entirely, showing little discrimination against anyone, flowing into the hearts of anyone who will open their ears to it. I don’t really have a taste, as of now. All of its many forms have sounded magical to me at some point in life. 10. Name one item on your bucket list, or more if you like? To never stop being curious. That’s a good summary of the many things on my bucket list. Sketches by Nitesh : This isn’t a ‘thank you’ nomination, because I’ve already said my thanks. I don’t know if I can nominate the person who nominated me (can I?) but I suppose I’ll bend the rules a little just this once.That’s because this guy deserves it. His sketches are as eloquent as his blog posts. I’m also looking forward to seeing where his story goes! Claudia F. Gomez : Her posts are upfront and personal, a reflection of a human being who is unafraid to take risks. Abirami – The Obsessive Writer : She has a way with poetry. Her works offer a fresh perspective, a picture painted with the colors of rhymes. Piper’s Adventures : I’ve no words for this, because they’re doing what I hope to do one day, and doing it beautifully. Capturing the soul of a land and its people. West Is Westeros : A blog dedicated to Game of Thrones, and easily my favorite of the lot. Every post is a delicacy for a GoT fan, as they’re all well-researched and well-written. Little Fears : Perfected the art of writing interesting stories in a few sentences. The accompanying illustrations are brilliant! Bird Flight : I love this blog. Period. Enough said. Say “Thank You” to the person who nominated you & link their blog to your post (You don’t have to post a link to my blog if you don’t want to, I wouldn’t mind that). 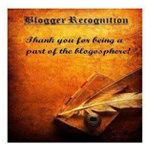 Pass the award on to 7 – 10 other bloggers and let them know they have been nominated. Include the Award Badge in your post. And now, you answer my questions. Why does writing appeal to you? Which post on your blog did you write on an impulse? And what do you feel about that post now? Which is your favorite animal, and why? Which movie influenced your writing, and why? Which character (from any film/ novel/ show/ you get what I mean) can you most relate to? Why? If you could choose to be a different living form(plant, animal, even a microbe), which one would that be? Are you attached to any one possession of yours? If yes, why? Have you ever been to a place that caused a radical change in your beliefs? After your post is complete, copy the link and add it to a post of theirs. You can change the question to whatever you want to ask from the people you nominate. Congratulations, agirlwhowrites! I look forward to seeing your posts, and am so happy we recently found each others’. Thank you so much for the nomination. You are so kind. It’s always nice to read about bloggers we know. The questions you wrote look very fun to answer. I’m so glad you think so! I really loved your blog posts, so I suppose it’s only fair that I nominate you. Thanks for writing such interesting stories, I truly look forward to more! I’m so glad you like my stories. I love writing them, even my simple ones. It feels so good to write down things that mean a lot to me. For that reason I really look forward to answering the questions you posed in your post. And I look forward to the answers! I’m sure they’ll be really interesting. Wasn’t expecting a post so quickly, I can see you are quite stoked. Congratulations, once again. Yeah, I had to write back. I just had to! You have to paste the link of this particular post into the latest post of everyone that you’ve nominated. AGIRLWHOWRITES, I hope you don’t mind, but I approached accepting your award nomination in a slightly different way than usual. I hope you don’t mind. I have invited people who see my response to post a few of their blog’s links in the above-mentioned post of mine (dated 07/30/17). That may allow me the lovely chance to become acquainted with some of your followers, and perhaps introduce them to some of mine. I love that idea! It will be so great to be able to interact with so many people that way. Cheers! Thanks, agirlwrites. So far a number of people have read my responses to your questions, but no one yet has shared links. I’m not sure why not. In time! ^^ It is a relatively new idea after all, but let’s hope people do respond!